This summer, from the 3rd to 11th of July, the KDE community will gather in Tampere, Finland for our yearly summit. We're happy to announce that the full program for Akademy 2010 has been decided upon. Check it out and see what to expect! Akademy is the annual conference of the KDE community and open to all who share an interest in what we do and have accomplished. This conference brings together artists, designers, programmers, translators, users, writers and other contributors to celebrate the achievements of the past year. Moreover, at Akademy visions for the next year are defined in mutual discussions between the participants. Of course we will also work on our technology, enjoy good company and entertainment and check out Tampere. The conference provides a great opportunity to meet likeminded people, to discuss and share ideas, learn about the latest desktop technology and be excited about what is coming. 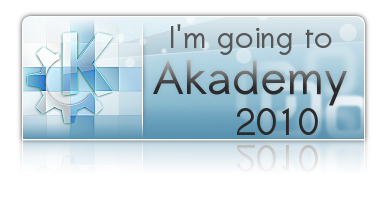 This year's Akademy conference program includes many exciting talks regarding the KDE community, development, applications, platforms, mobile computing, and cloud computing. The conference will open on day 1 with a keynote from Valtteri Halla (Nokia) who will speak about MeeGo redefining the Linux desktop landscape. On day 2, long-time KDE contributor and visionary Aaron Seigo will give the midday keynote and discuss the future of Free Software and the KDE community. Registration for Akademy is also open and we urge you to register as soon as possible! Please see the hotel and travel page for more information about the conference venue, traveling to Tampere, Finland, and finding hotel accommodations. Notice that those who look forward to beer can come as well. After all: "and be excited about what is coming" certainly includes beer. And wine. Coke too, if that's your thing, or orange juice. Spiced up with good company. Pizza, probably, too. And Indian food, often lots of it. I learned to appreciate Indian food at KDE meetings, and these days I regularly cook it myself! No we won't force anyone to do something he/she doesn't want. At least, once we're done with you, you'll WANT to believe 5 fingers is 4 fingers, and we've always been at war with Oceania! Reading through the schedule proves it surely is going to become an interesting week :) Looking forward to be there!